Khayla is now 18 months old. She drinks a lot of milk. She pees a lot. Suddenly, I find that the cloth diaper is leaking! But I like being the super Earth-friendly mommy! I don't mind washing her cloth diapers, because it just needs rinsing and then thrown into the washing machine for the rest. And we save 2 diapers (disposable ones) a day, minimum. Plus, she doesn't have red rashes on her private area due to prolonged exposure to her urine whenever she wears the cloth diaper. 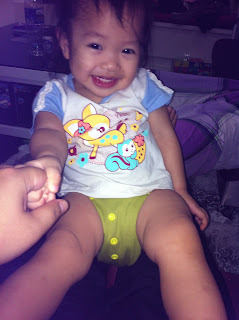 So for a few months my not-so-Earth-friendly hubby refused to put on cloth diapers on Khayla. Instead, it's only reserved for swimming activity. But for wearing in the house, especially at the prospect of accidents as Khayla likes to sit in his lap, he's not so keen on that. So I look and look for the solution. Turns out I just need to put an extra insert in the diaper. Wearing two inserts means she can play, run, waddle, climb and sit in our lap without the danger of leaking cloth diaper. So for the second baby, I am aiming to have at least 20 cloth diapers and 10 extra inserts so we can save a lot on disposable diapers not just for the second one, but also for Khayla. Last week, I tried out their online store to order two CDs and biodegradable diaper liner (because a newborn does not wet the diaper that much, but they pee and poo frequently). The service is quite fast. Within 2 days, I received my order. I'm also wearing Lunatots Suri Pantyliner, which is their cloth pantyliners during my pregnancy due to leukorrhea. Not only it makes me more comfortable, I don't have to worry about running out of stock of pantyliners as I did last time. And it dries fast! :) I have four of them yet I don't run out of it even though I wear it daily. Two thumbs up to Lunatots!